One Man's Lonely Adventures In His R33 Skyline GT-R: Busy but Exciting Day! First, an early morning blast on the streets of Tokyo in my car accompanied by DCD to Robson - yes, as in Robson Leather (and now to be known as Robson Maturity - as Masa, Robson's president explained - Robson is actually a mountain in Canada, and once you get to the top of a mountain, have to maintain...). Anyway I think you know Robson is known for the superior leather upholstery work they do... don't like your standard cloth seats? Go see Robson. How about gear shift and parking brake boots - the factory is some kind of cheap vinyl. Replace with real leather at Robson. And of course, yes, they redo worn out steering wheels - and upon request change the shape of the steering wheel to (to give it those nice thumbgrips). 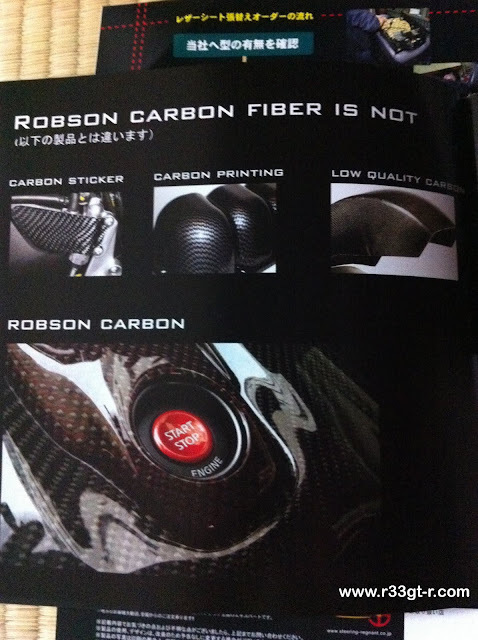 Oh, and people who know Robson also know that they do, in addition to the world's finest aftermarket leather work, they also do the world's finest carbon fiber work as well! 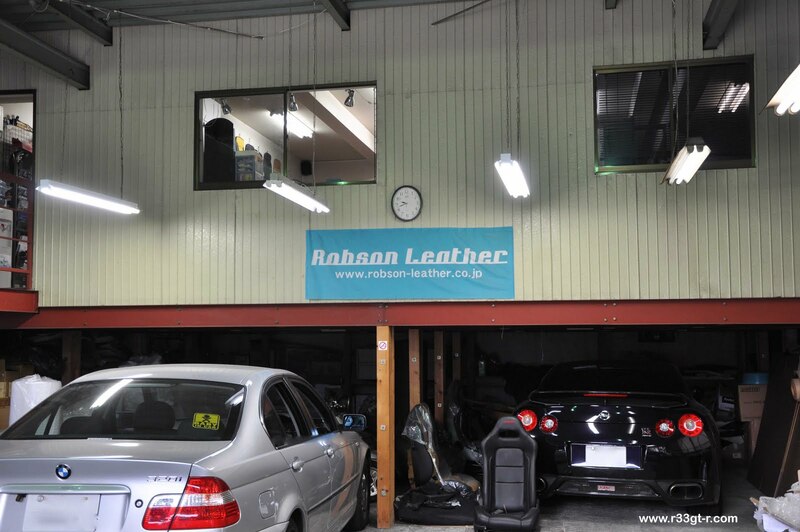 So we drive up and despite Robson's world-wide fame, it's very much a no-nonsense workspace - the factory on the ground floor, and the offices and showroom above. And yes, that is their demo car GT-R... a Spec-V to boot! Check out how 3-D their carbon fiber is! Masa-san told me they have 17 (!) 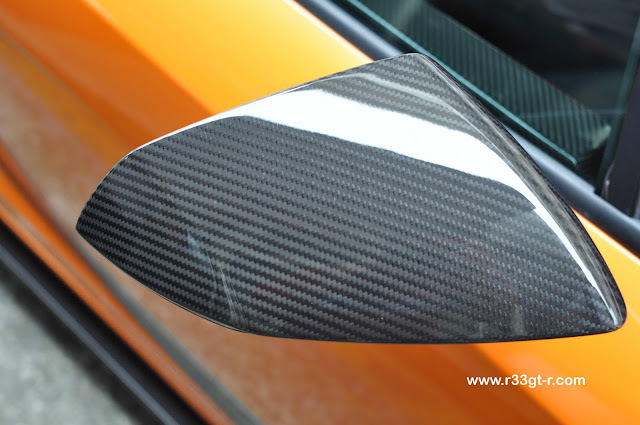 layers of gloss on top of the carbon...wow! 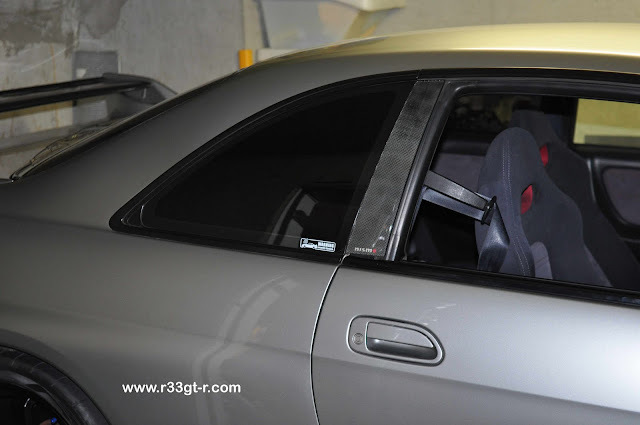 But whatever - this is a blog about R33 GT-Rs. Suffice to say that looks aren't everything, right? 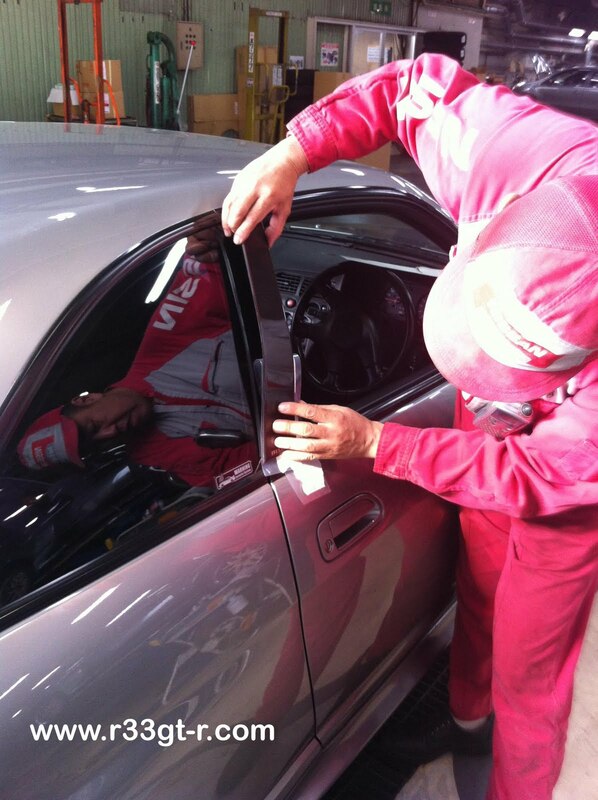 Anyway, I had an errand to run at Nissan Shinagawa, so we drove both cars there. 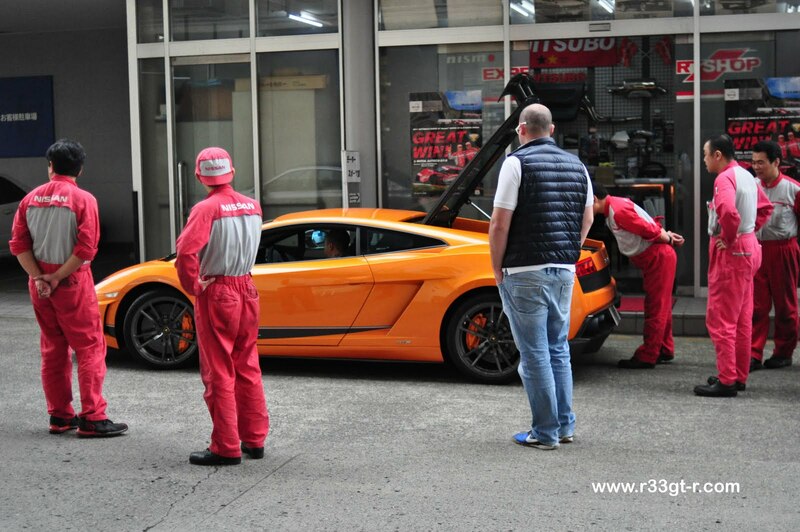 Finally they tore themselves away to get back to work.... nice to see these are all real car guys! Koyama-san was taking photos, I think this scene may make their blog, will provide a link if we do! 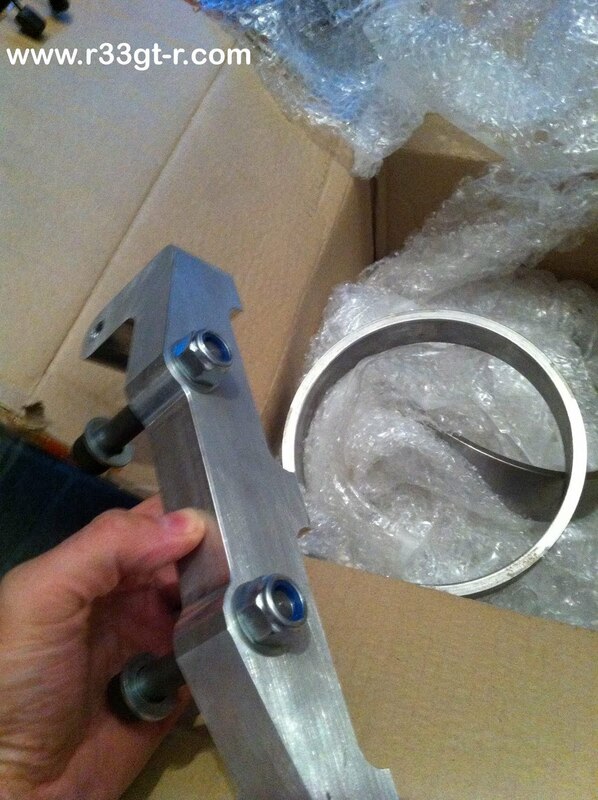 I had a few pieces I had ordered earlier that I was there to pick up - I finally got the Nismo B-pillar carbon pillar garnish (part number 99993-RN593), along with the Nismo carbon rear wing side caps (officially "Rear Spoiler Ornaments" - part number 99993-RN595 FYI). Lacking confidence of a smooth install, I had Sugimoto do the install there. Not a good photo, but here is it how it looks now... will try to remember to take a picture during the day later. Spoiled now... Kind of wish Mine's would bring back their carbon fiber mirrors for the R33... I asked but was given a vague response (ie Japanese for "no")... oh well. Maybe Robson? LOL. What is this? 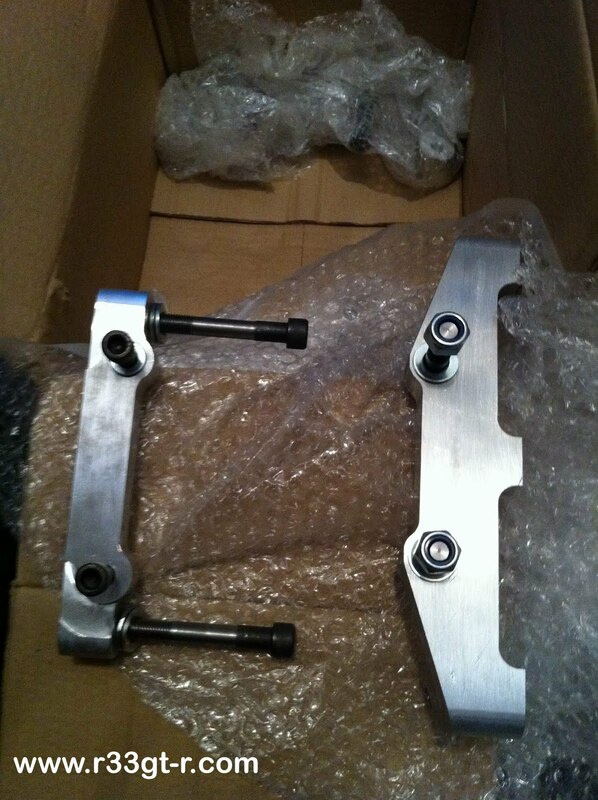 Why, they're brackets for brake calipers... so stay tuned to see what brakes I chose to install on my GT-R!